They help to release the articular and muscular tensions, to relieve the feeling of pain and stiffness and allow to find the original flexibility of movements, naturally. 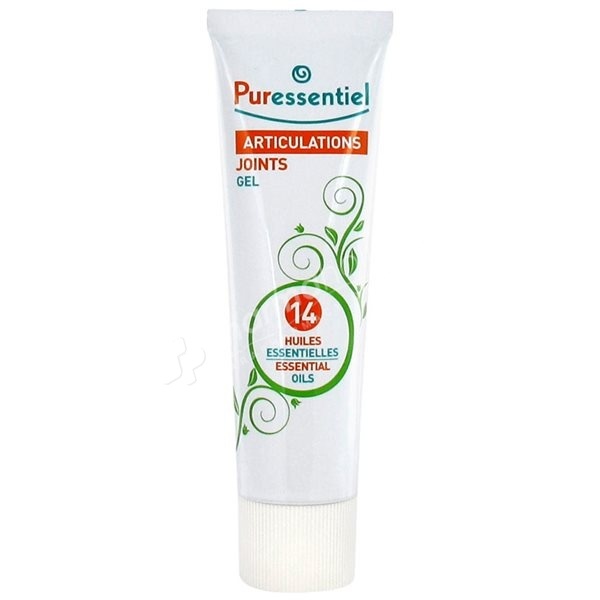 The 14 essential oils gel Puressentiel Joints have anti-inflammatory, analgesic, anti-stiffness, swelling promoting anti-relaxant and soothing action. They help to release joint and muscle tension, relieve the sensation of pain and stiffness and help regain flexibility movements, naturally! Puressentiel Joints acts effectively and quickly by epidermal penetration and frees its assets on sensitive areas to treat. Its formula is based on active 100% natural, essential oils and associates 14 (Cajuput , Roman Chamomile, Clove, Eucalyptus, Wintergreen Lying, Juniper, Lavender, Marjoram, Peppermint, Niaouli, Nutmeg, Pine, Rosemary, Turpentine and Capsicum). This gel formula is ideal for a gentle massage and targeted large areas (back, legs, shoulders) as small areas (neck, wrists, knees, ankles, fingers ...). Result, you feel more flexible, more relaxed, your movements are facilitated, the pain subsides, your body relaxes, you are less stiff or "rusty". Apply the gel to aching joints or muscles (back, neck, shoulders, elbows, wrists, hands, hips, knees, ankles, feet), whenever necessary, well into the skin. Wash hands after use. 3 applications are recommended daily (morning, afternoon and evening).